For the ideas of individual countries, see national ideas. For the ideas of American natives, see native ideas. As a nation develops technologically, it unlocks the ability to gain additional idea groups. Investing into a full idea group can take a long time and cost several decades worth of power. The act of choosing at any point of time a certain idea group over the other and advancing in it represent the time and focus nations choose to spend historically along certain administrative, diplomatic, and military specializations. Each nation can have up to 8 idea groups from a pool of 19 groups (only 18 are shown as 2 idea groups are government type exclusive). Idea group choice is only restricted by the requirement for a balanced mix of groups; a new group must not have its affiliated monarch power be the in same category as more than 50% of the total idea group composition the nation holds at the time. This limit can be turned off before starting a game and works on Ironman. There is no restriction on the groups themselves and any nation may pick any group at any point in the game. That being said, AI nations have had weights assigned to the idea groups to simulate random but somewhat historical idea picks. Each idea group itself consists of 7 ideas. Advancing within an idea group is done sequentially and each unlocked idea enhances a certain aspect of the nation. Unlocking the last idea in the group also unlocks the group bonus. Abandoning an idea group can be used to free up an idea slot if it no longer serves the nation and there may be others more suitable groups that do so. It is important to note, however, that doing so will result in losing all the given bonuses from said idea group and will only refund 10% of the monarch power points invested in the group. Discarding idea groups will also impact the number of Ideas a nation has towards unlocking National Ideas and Ambitions. Primitives can take only the first 3-4 Exploration ideas, get a colonial border with a western power, then drop Exploration for something else. Some would benefit more from the Expansion idea group; but Expansion doesn't allow Explorers or long-range island-hopping. They could even opt out of colonization altogether after getting the border they needed. Each unlocked idea grants a -2% Technology cost reduction. The reduction can result in up to -14% for a fully unlocked idea group (without accounting for further reductions that may be applied from the ideas themselves). The type of the reduction depends on the affiliation of the idea group; for example, the Espionage idea group grants Diplomatic tech cost reduction. Policies become enabled when a pair of 2 idea groups are fully unlocked. Picking a policy provides a bonus to the nation at the monthly cost of 1 monarch power per policy (type of monarch power used depends on policy affiliation). Once picked, a policy cannot be canceled for a duration of 10 years. There is no restriction on policy composition and a nation can activate up to 5 policies at a time. Unlocking an idea has a base idea cost of 400 monarch power (the type of power depending on the idea group). event: “The Counter-Reformation Ends” (2051): The reformation started 150 years ago. event: “The Counter-Reformation Ends” (2050) for non-Catholic countries. event: “The Counter-Reformation Ends” (2052): has the idea: Liberté, Égalité, Fraternité. event: “The Counter-Reformation Ends” (2053): has the idea: Ecumenism. event: “The King of the Jesuits” option ‘Religious Freedom won the day’. −5% Islamic center of Scholarly Learning Muslim decision: “Establish an Ibadat Khana” until the state religion is changed. for the rest of the campaign. until ruler changes or the event “Pacify the Sejm”. for 60 years. until ruler changes. for maximum 10 years or until the state religion changes. −5% Andalucian Moors Moroccan event: “Moorish Refugees” for 10 years. −5% Moorish Refugees Muslim event after the fall of Granada for 25 years. −5% The Medici Oriental Press Tuscan event: “The Medici Oriental Press” for 30 years. Every country has seven national ideas. 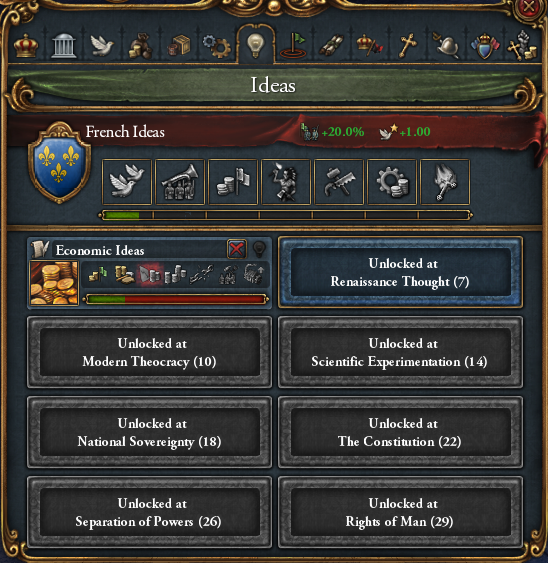 These ideas do not cost any monarch points but instead are unlocked; one national idea is unlocked for every third idea bought normally from an idea group. Many nations have unique national ideas while a large number of others have national ideas based upon a common geographic region or a shared culture. The rest of the nations, who lack unique NIs or don't share a common NI group, draw their national ideas from a common generic set of ideas. Every nation also starts with a national tradition: two abilities which define the history and heritage of the country. Countries also have a “national ambition”, which is a bonus that is unlocked when a nation has gained all seven of its national ideas. This bonus is also unique for each country. Administrative power is required to unlock ideas within these groups. Diplomatic power is required to unlock ideas within these groups. Military power is required to unlock ideas within these groups. Enabled by most monarchies (except the Plutocracy reform), theocracies, steppe nomads, and the Noble Elite republican reform. Enabled by most republics (except the Noble Elite reform) and monarchies with the Plutocracy reform. Idea group events are pulse based events. They occur at regular intervals (5 years) based on the nation's idea groups (not all groups are on the same interval). In addition, the choice of ideas also has some influence in how often an event may happen, known as MTTH; meaning they can increase or decrease the likelihood of a certain to happened in over other events in their pulse group. The AI is dynamically determined according to the current conditions of the country. To decide which idea group it should take, the AI employs a "weight system": each idea group is given a certain weight and the higher this weight is for an idea group, the higher the chances that the AI will choose it. The AI will never choose an idea group with a weight of 0. ×0.1 is not in one of the following technology groups: Western, Eastern, Muslim. ↑ See in /Europa Universalis IV/common/defines.lua: ABANDON_IDEAGROUP_REFUND = 0.10, -- The part of the idea group spent that will be refunded upon abandonment. ↑ 4.0 4.1 4.2 4.3 4.4 4.5 Only available with Star and Crescent DLC. ↑ 5.0 5.1 Only available with American Dream DLC. ↑ It is still possible to revert to the old system by changing "AI_USES_HISTORICAL_IDEA_GROUPS" to 1 in /Europa Universalis IV/common/defines.lua. Note, however, that the AI will never use historical idea groups in a custom/random setup. ↑ The weights and their modifiers are defined in /Europa Universalis IV/common/ideas/00_basic_ideas.txt at the bottom of each idea group (ai_will_do). This page was last edited on 16 December 2018, at 09:53.